Math Seeq and Math Seeq lite! Learn simple and complex sequences while having fun! Math Seeq is an educational game that teaches you about mathematical sequences and series while playing a game. You are told what the sequence will be and the first number. 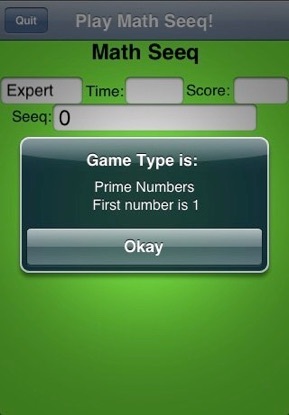 You must select the next correct number in the sequence from numbers that are moving around the screen. You have a set amount of time and you get points and additional time for each correct answer. Make a mistake and you will lose time and points! - Includes ‘times tables’, multiples of 1,2,3,4,5,6,7,8 and 9 in beginner level so you can practice your times tables while having fun! Higher levels include geometric sequences, primes, odd numbers and the Fibonacci sequence! Math Seeq lite is a free version of Math Seeq. With Math Seeq lite you can play with the first five levels of the times tables, so you can seeq and tap the sequential numbers: (1,2,3,4,...), multiples of two (2,4,6,8...), and multiples of 3, 4 and 5. Save your high scores and see how fast you can find and tap the correct answers! If you like Math Seeq lite, please purchase the full version of Math Seeq to get the entire set of times tables, plus three other challenging levels using many more sequences! Click on the logo to be taken to the link to Math Seeq in the App Store. May 12, 2009: “Math Seeq lite” has been awarded with the “Editor’s Choice” award from Brothersoft.com! January 14, 2009: “Math Seeq" has received a great review by Tracy Sebastian from iPhone Life! Visit http://www.iphonelife.com/blog/3963/math-seeq to read the Math Seeq review. Ms. Sebastian gave Math Seeq an 8 out 10 rating. We thank Ms. Sebastian and iPhone Life for their complimentary review on Math Seeq. Math Seeq now has an iPad® version!